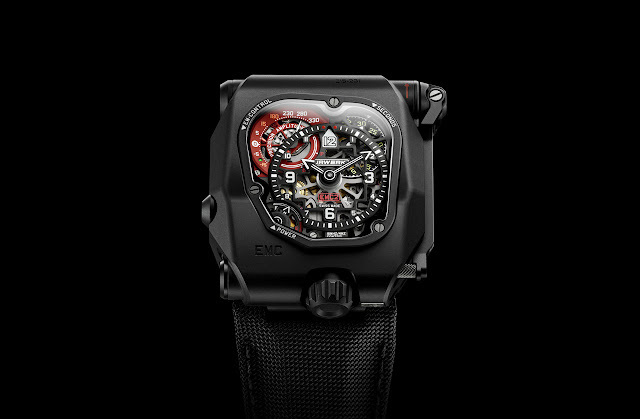 Unveiled in 2013, the Urwerk EMC (Electro Mechanical Control) introduced a whole new concept in watchmaking: a smart mechanical watch which allows the owner to verify the precision of his timepiece and fine-tune it to suit the personal lifestyle thanks to an electronic module that monitors its rate. By simply pressing a button you discover whether your watch is running fast or slow and the amplitude of its balance. Urwerk is now presenting the EMC TimeHunter X-Ray, a 15-piece limited edition where the mechanism, the wheel-train and the electronic circuits are all revealed. The TimeHunter X-Ray is easy to read with a central dial for black hours and minutes hands coated with white SuperLuminova for enhanced contrast. A rotating disc showing the seconds at 1 o'clock is visually balanced at 7 o'clock by a power-reserve indicator while, at 10 o’clock we find the performance indicator showing rate (± 15 seconds a day) and balance amplitude. On the back of the watch the movement can be seen through the sapphire crystal revealing the two worlds that here live together: electronic circuits and the finest mechanical movement. In fact, while the movement of the EMC is 100% mechanical, the watch also houses an electronic brain. An optical sensor on the balance wheel captures the precise rate of oscillation of the 4 hertz (28,800 vibrations per hour) regulator, over a period of 3 seconds and compares it to the reference rate provided by a 16,000,000 hertz electronic oscillator. An integrated circuit determines the difference between the timing rate of the movement and that of the reference oscillator. The timing adjustment screw allows the owner to make very fine adjustments to the balance rate regulator by changing the active length of the balance spring. When the button on the left side is pressed, a hand points to one of two symbols: δ (the rate is being measured) or P (insufficient energy). If the measurement is possible the hand first points to the rate (± 15 seconds a day) and then, after a short pause, the amplitude of the balance. In addition, a light emitting diode shows green if the watch is performing correctly and red if the rate is outside acceptable tolerances. The energy for the electronic rating module does not come from an ordinary battery but from a capacitor that can be recharged between 100,000 and 200,000 times by turning the crank on the right side. 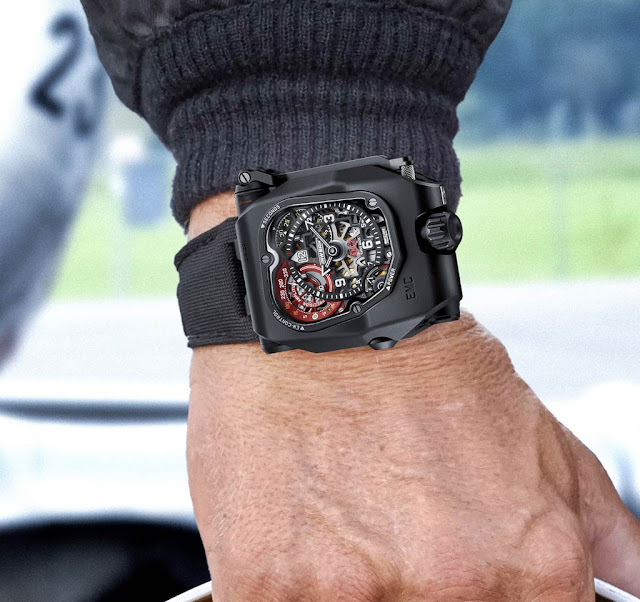 The 43 mm x 51 mm x 15.8 mm case is made of grade 5 titanium and steel with black PVD treatment and it is water resistant to 30 metres / 100 feet. For more information on how the ECM works, please refer to this detailed article. 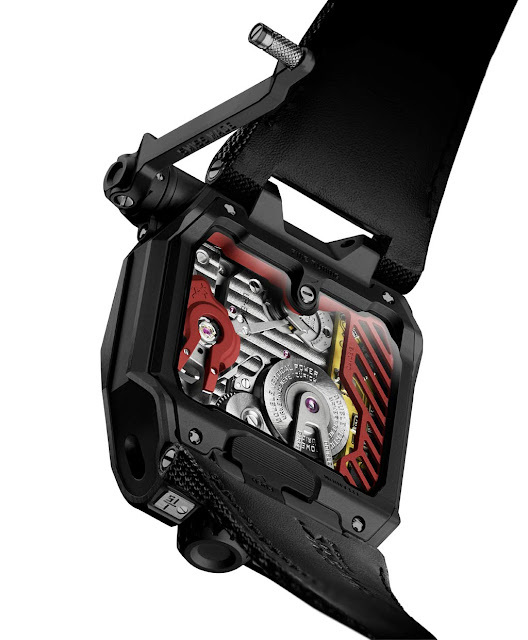 Urwerk EMC TimeHunter X-Ray. 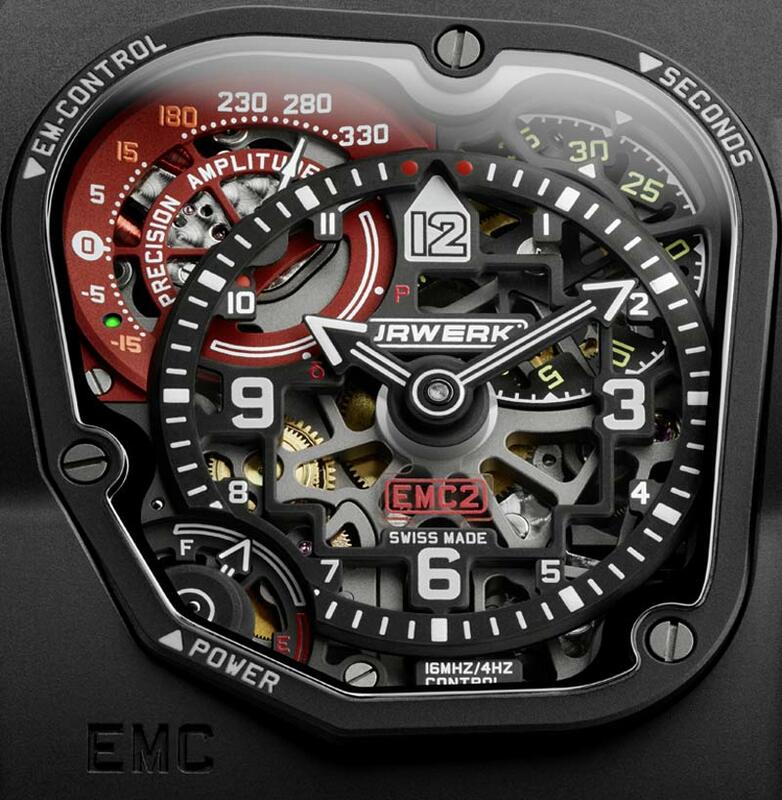 Unveiled in 2013, the Urwerk EMC (Electro Mechanical Control) introduced a whole new concept in watchmaking. 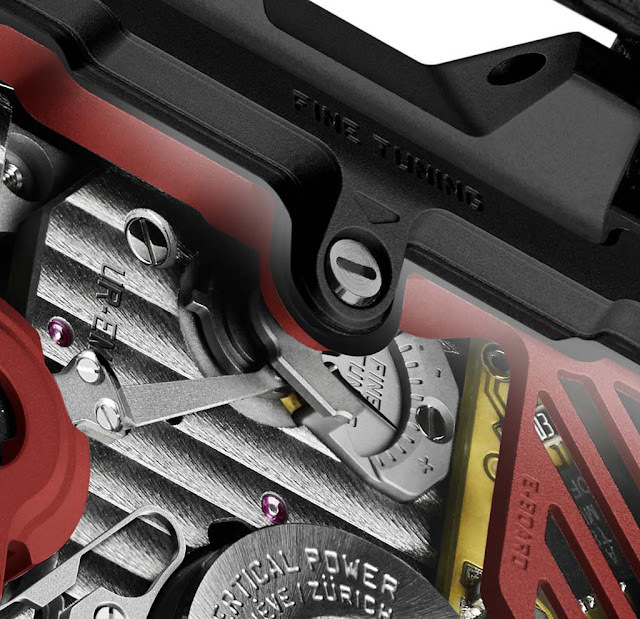 Urwerk is now presenting the EMC TimeHunter X-Ray, a 15-piece limited edition where the mechanism, the wheel-train and the electronic circuits are all revealed. The Urwerk EMC TimeHunter X-Ray has a price of Swiss Francs 125,000.